What would be the living room furniture without a coffee table? Incomplete – even if you’re more of a tea person! 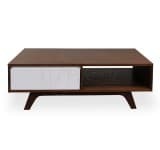 After all, the coffee table is destined to be a centrepiece, and you need a product worthy of the task, something that would effortlessly complement the style of your furniture and, overall, your living room!